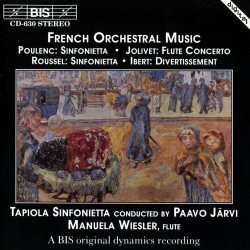 In his early years with BIS, Paavo Järvi turned in a fantastic album of French orchestral fireworks. Anchored by Poulenc and Ibert, this disc is a sheer joy, and a major step ahead of Järvi’s recent, rather dour Poulenc interpretations on Deutsche Grammophon. Poulenc’s Sinfonietta is a big work, belying the title. At nearly a half-hour, and in four solidly-built movements, it’s one of the composer’s biggest orchestral works. It’s an appealing blend of the hard-edged and the yielding. We’re not too spoiled for choice in the Sinfonietta, but what choices we do have are terrific. For one thing, there’s Charles Dutoit on Decca, now safely housed in a box set of ballets, concertos, and sacred music. Järvi is slightly faster in every movement except the finale, his interpretation favouring brash modern edges and the zippy sonority of a smaller orchestra. Dutoit has more French charm in the slow movement, especially, but he’s softer and more genial everywhere. The parade of juicy rarities continues. Albert Roussel’s Sinfonietta is a rather savage little neo-classical piece for strings, here whipping up a buzz of energy. You can also find it in Naxos’s superb set of the Roussel symphonies. André Jolivet’s flute concerto is the most tonally adventurous work here, but it’s a heady, delicious stew. You have the primitivist Stravinsky-like melodic energy, ever-innocent associations with the lyrical solo flute and a sleekness that can only be described as French. The grand arc, if there is one, is all about whether and how much Jolivet is winking at the audience in any given movement. The finale is a thriller. Manuela Wiesler’s solo performance is outstanding. Best for last. We have Jacques Ibert’s Divertissement, one of the most joyously silly works ever composed. This is the one where drunken trombones crash the Mendelssohn wedding march, a campy waltz erupts from a nocturne, a self-important parade tromps across the stage, and then the finale concludes in a fury of whistle-blowing. I grew up listening to Kunzel conduct the Cincinnati Pops on Telarc, then moved on to accounts on Naxos (Orchestre des Concerts Lamoureux, Yutaka Sado) and Dutoit/Montreal. Järvi beats the pants off all of them. It’s simple: he takes the lunacy to an inspired new level, from the very first ear-splitting trombone raspberry. Take the beginning of the finale, when the main tune gets interrupted for a trumpet solo that goes awry. Every performance you’ll hear has the trumpet play in tempo but with the final note, as written by Ibert, intentionally “wrong”. The Tapiola Sinfonietta trumpeter on this recording, however, has other ideas. He hits an actual wrong note, then slides into Ibert’s. It’s deliberate, excruciating and uproariously funny. Elsewhere Järvi masters the art of pitting tempos against each other to maximize contrast, making the piece feel like it was assembled out of scraps. It’s quick, snappy, clear-textured and totally lovable. The Tapiola Sinfonietta, as indicated, plays with guts, virtuosity, and madcap inspiration. The early BIS sound was personally engineered by founder and CEO Robert von Bahr. This is not just a great way to fill some gaps in your collection: it’s a great way to spend an hour and a wildly fun, funny album.